Sir Peter Colleton received a land grant of 12,000 acres. The property became known as the Fairlawn Barony. 1726  A tract of land from the Barony, known as Exeter, was leased to Hugh Butler by Sir John Colleton (son of Sir Peter) (1). Hugh Butler built a house on Exeter. The house did not belong to him since he built on leased lands (1). 1749  Sir John Colleton died and left Exeter to his minor son, John Colleton (1). 1767  John Colleton (grandson of Sir Peter) sold 988 acres known as Exeter to Mary Broughton (5, p. 109). 1842  T.O. Dawson owned the plantation (5, p. 35). 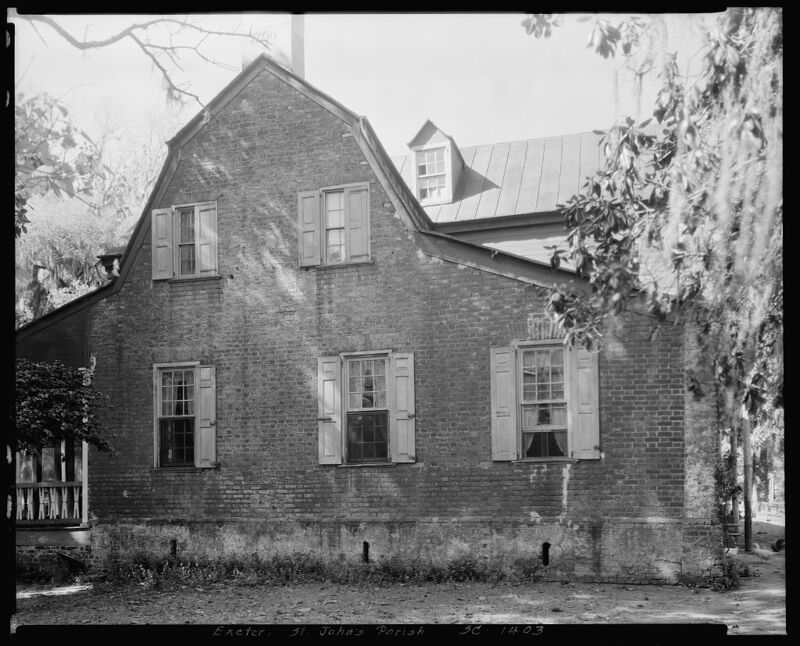 1902  Jadon Solomon Jones, Sr. bought the plantation from the Motte estate (1). NOTE: There are conflicting resources in regards of which party Mr. Jones purchased the plantation from. Please let us know if you have documentation regarding this transaction.
?  Mr. J.W. Jones owned the plantation (1).
?  Mr. and Mrs. Charles A. Jones were the next owners of Exeter (1). Information contributed by Bob Manning whose great-grandfather, Jadon Solomon Jones, at one time owned the plantation.